Following are books and magazines in which Carla has been featured. Carla’s work also appeared in Splash5 – The Glory of Color published by Northlight Books and Exploring Color by Nita Leland. 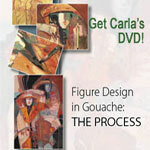 Carla was featured in an article for American Artist Magazine in 2008 (online at artistdaily.com). 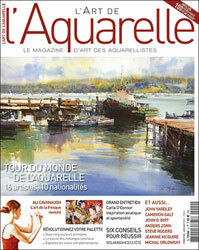 Carla’s article, “The Mark of Experience,” appeared in the August/September 2000 issue of International Artist Magazine. Her work was included in “When Figures Emerge” in the Winter 2001 issue of Watercolor Magazine. Carla also contributed to “Charting a New Course in Watercolor” written by Joanne Moore in the September 2001 issue of The Artist’s Magazine, “Launching A Workshop-Teaching Career” by Beth Patterson in the Fall 2002 issue of Watercolor Magazine and to “From the Inside Out”, June, 2004 issue of Watercolor Magic Magazine. Carla was among the artists featured in “Creativity – What Inspires 5 Top Painters”, The Artists Magazine, Oct. 1998; “What Is Abstract Art”, International Artist Magazine, Oct.-Nov. 1998; and Watercolor Expressions, Rockport Press 1999.